Following two sell-out seasons in Melbourne, Legends in Concert will be back from the 10th to the 27th of January 2019 and feature the line-up that you, the fans requested. "Legends in Concert is thrilled to be back at the Palms for another fantastic summer engagement, especially with so many visitors in Melbourne during January”, said Mark Kogan, General Manager Legends in Concert Limited Engagements. “The past two years of our engagements have been so successful and well received by the audiences at The Palm that there will be an extra week of performances in 2019 starting on January 10 and running through January 27. And we've done something very special: Legends in Concert fans were able to choose whom they wanted to see featured in the next Legends cast," said Kogan. "During their last engagement, we surveyed many fans during our sold-out Legends shows on what featured performers they would like to see in addition to fans favourites Elvis Presley and Michael Jackson. The January 2019 engagement will have this specially selected all-star line-up of the best tribute artists in the world, with amazing dancers and a rocking live band. The shows at the Palm have been among the best Legends shows I have ever been involved with and I have no doubt that this upcoming engagement will be one, too." You will hear many of the legendary songs of artists you know and love, sung with pitch perfect live vocals as the legends portray Rod Stewart, Tina Turner, Stevie Wonder, Elvis Presley, Michael Jackson, Donna Summer, Cyndi Lauper and Kenny Rogers. 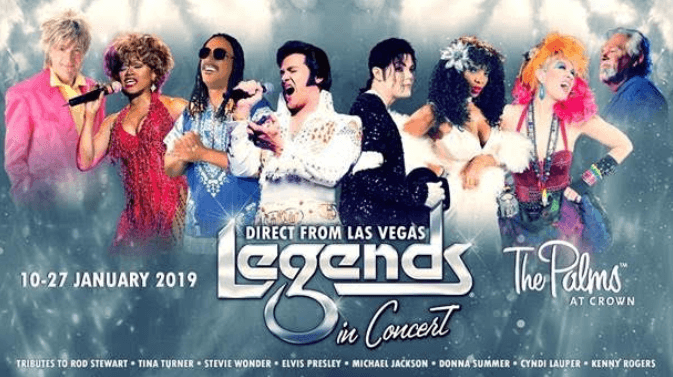 Direct from Vegas, Legends in Concert is the largest and widely regarded as the world’s greatest live celebrity tribute show. This internationally-acclaimed production takes audiences on an electrifying journey through the songbooks of some of music’s most legendary singers with world-renowned tribute artists, a live band, talented singers and dancers, splendid multimedia theatrical sets and authentic costumes. The tribute artists perform using only their own natural voices and are backed by a live band that rocks the house with vivacious back-up singers and dancers. Returning by popular demand in 2019 will be Michael Jackson (Damian Brantley) and Elvis (Kevin Mills). From a young age, Damian Brantley has been inspired by the "King Of Pop" Michael Jackson and he has re-created the legend after years of perfecting his act. Kevin Mills' authentic portrayal and fascinating interpretation of Elvis Presley has made him one of his country’s most sought-after and popular performers in the industry. Legends in Concert made its Las Vegas debut in 1983 as an initial six-week engagement in the centre of the Las Vegas Strip. It is the longest-running production in Las Vegas’ history with its flagship show at the historic Flamingo Las Vegas Hotel and Casino. Legends in Concert has entertained more than 35 million fans and 2018 marks its 35th anniversary. Tickets to Legends in Concert at The Palms at Crown Melbourne go on sale on June 12 for 20 special performances in January 2019.